For the Titans, it was Deja Vu all over again. Wrestling Alumni were present for the 2nd Annual Homecoming, 11 wrestlers out of 12 went to the finals, and only 4 managed to bring home gold. 101 – Freshman Jasjot Bedi fought hard but came up short against his opponent from Yokota and settled for silver. This was Jasjot’s best finish in a tournament this season and a good momentum builder going into the Far East Championship in two weeks. 108 – Eji Kasahara got himself back on track after taking 3rd at The Beast a week earlier. He wrestled confident and smart to bring home the gold for the Titans. Eji has been consistent all season and as long as he maintains stamina at Far East, he’ll be a tough one to beat in the finals. 115 – Harold Mancia looked good in his early round match and then repeated some of the same mistakes that resulted in his 4th place finish at The Beast a week earlier. As coach Yabui commented, “I’d rather have the mistakes now and the win at Far East.” Harold’s got the technique and strength to capture gold at Far East, he’ll just need to minimize the mistakes. 122 – Captain Tatsuhito Matsumoto showed why he’s ranked #1 in this weight class as he easily handled his early round opponent as well as his final’s match. Tatsu is peaking at just the right time and looks to be the favorite going into Far East. Tastsu is going into Far East with just one loss this season. 129 – In this season’s third installment of “The Battle of Far East Champions,” Rio Lemkuil came up short again against Lucas Wirth of Kinnick. Having been bested by Wirth in the season opening dual and then again at Beast, Rio was looking to take a little back at Kanto but just couldn’t pull it out against this very evenly matched opponent. With history on his side, however, Rio’s revenge may come at Far East which would be a repeat of last season. 135 – Dai Matsumoto continues to struggle in the big matches in an tough weight class. Dai has consistency and stamina in his favor though as he heads into Far East. Missing The Beast a week earlier didn’t help Dai’s chances as it was one less chance to size up his Kinnick opponent as well as other non-Kanto wrestlers. With plenty of matches to keep him going at Far East, Dai should be able to keep his motor running and get another chance to take down his Kinnick opponent. 148 – Nishant Chanda bettered his Beast performance and took silver in front of the home crowd but still needs to figure out how to fight through those high pressure matches. He’s definitely got the strength and technique to take this weight class at Far East but he’ll need to get a solid 5 matches in to make noise at the Far East finals. 158 – Ryo Sawa wrestles with confidence and can dominate in the early rounds as he did again this week before allowing his Kinnick opponent to take the gold. Ryo can definitely get himself to the Far East finals he’ll just need to stay focused and wrestle “his match” if he wants to bring home the gold. 168 – Austin Koslow had a tough day – no matches before the finals, which means he waited over 6 hours before getting on the mat for the first time all day, and then one mess of scoring mistakes by the officials continually broke any momentum he could build during the match. In a match that actually lasted more than 12 minutes due to delays and sidebar debates between officials, Austin outlasted his Kinnick opponent and won gold by a 4-2 decision. 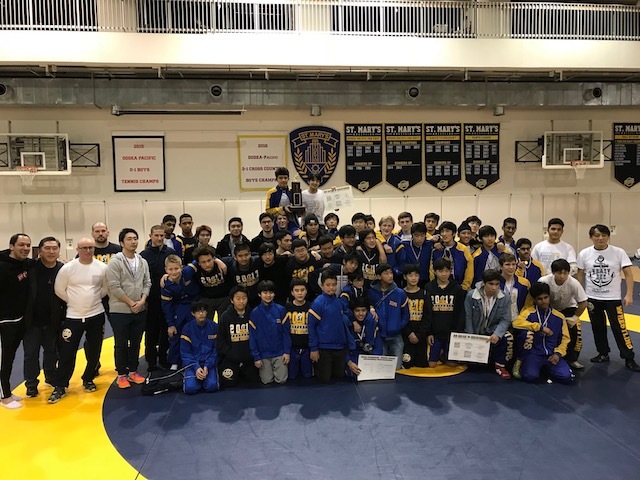 Austin wraps up the Kanto season as the only undefeated varsity wrestler on the team going into the Far East Championship. 180 – Alex Patton wrestled smart in both of his matches to bring home gold for the Titans and position himself as Kanto’s top wrestler at 180 lbs going into the Far East Championship. Having missed The Beast, Alex will be facing a few wrestlers for the first time this season in a couple weeks, but if he continues to wrestle smart he’ll be in contention at Far East as well. 215 – Nilay Hingarh faltered early but kept his composure and wrestled hard to grab 3rd. Inlay just gets going a little too slow and struggles with his early matches in Tournaments. He’ll need to come out faster and stronger at Far East to get himself in the finals. He has the tools to beat every other 215 in Kanto, he just needs to open the tool box a bit earlier and take it to his opponent. 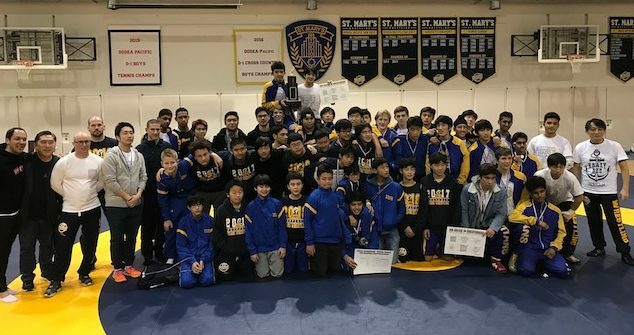 “We can put just as many wrestlers into the finals at Far East as we did today at Kanto,” commented Coach Yabui.